Igor Fyodorovitch Stravinsky (Russian: Игорь Фёдорович Стравинский) (June 17, 1882 – April 6, 1971), a Russian-born composer, is thought to be one of the most influential composers of the 20th century. His musical language evolved over the years through many stylistic periods including neoclassicism and serialism, though he is perhaps most remembered for his early works, written in a primitive style for Sergei Diaghilev's Ballets Russes; L'Oiseau de Feu (The Firebird), Petrushka and Le Sacre du Printemps (The Rite of Spring). For I consider that music is, by its very nature, essentially powerless to express anything at all, whether a feeling, an attitude of mind, a psychological mood, a phenomenon of nature, etc. Expression has never been an inherent property of music. That is by no means the purpose of its existence. If, as is nearly always the case, music appears to express something, this is only an illusion and not a reality. It is simply an additional attribute which, by tacit and inveterate agreement, we have lent it, thrust upon it, as a label, a convention – in short, an aspect which, unconsciously or by force of habit, we have come to confuse with its essential being. 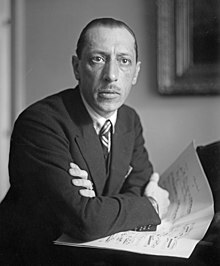 Igor Stravinsky (1936). An Autobiography, p. 53-54. I was…attacked for being a pasticheur, chided for composing “simple” music, blamed for deserting “modernism,” accused of renouncing my “true Russian heritage.” People who had never heard of, or cared about, the originals cried “sacrilege”: “The classics are ours. Leave the classics alone.” To them all my answer was and is the same: You “respect,” but I love. Igor Stravinsky. The Observer, Oct 8, 1961. One has a nose. The nose scents and it chooses. An artist is simply a kind of pig snouting truffles. 1962, quoted in Andriessen and Schoenberger, The Apollonian Clockwork (1989). Oxford: Oxford University Press. The over-publicized bit about expression (or non-expression) was simply a way of saying that music is supra-personal and super-real and as such beyond verbal meanings and verbal descriptions. It was aimed against the notion that a piece of music is in reality a transcendental idea "expressed in terms of" music, with the reductio ad absurdum implication that exact sets of correlatives must exist between a composer's feelings and his notation. It was offhand and annoyingly incomplete, but even the stupider critics could have seen that it did not deny musical expressivity, but only the validity of a type of verbal statement about musical expressivity. I stand by the remark, incidentally, though today I would put it the other way around: music expresses itself. Igor Stravinsky and Robert Craft (1962). Expositions and Developments. Igor Stravinsky. "Subject: Music", New York Times Magazine, 9/27/64. The phenomenon of music is given to us with the sole purpose of establishing an order in things, including, and particularly, the co-ordination between man [sic] and time. Quoted in DeLone et. al. (Eds.) (1975). Aspects of Twentieth-Century Music. Englewood Cliffs, New Jersey: Prentice-Hall. ISBN 0130493465, Ch. 3. from Igor Stravinsky' Autobiography (1962). New York: W.W. Norton & Co., Inc., p. 54. Music's exclusive function is to structure the flow of time and keep order in it. Quoted by Géza Szamosi, The Twin Dimensions: Inventing Time and Space (New York, 1986), p. 232. Igor Stravinsky and Robert Craft (1982). Themes and Conclusions, Berkeley: University of California Press. Much of the music is a Merzbild, put together from whatever came to hand. I mean, for example...the Alberti-bass horn solo accompanying the Messenger. I also mean the fusion of such widely divergent types of music as the Folies Bergeres tune at No. 40 ('The girls enter, kicking') and the Wagnerian 7th-chords at Nos. 58 and 74." What I cannot follow are the manic-depressive fluctuations from total control to no control, from the serialization of all elements to chance. Composers combine notes, that's all. It is the transcendent (or 'abstract' or 'self-contained') nature of music that the new so called concretism--Pop Art, eighteen-hour slices-of-reality films, musique concrete--opposes. But instead of bringing art and reality closer together, the new movement merely thins out the distinction. It was because the melody and harmony were so fresh that we found Russian music irresistible. This freshness was no matter of choice. Musicians of the West had established the foundation of their whole tonal concept, both melodic and harmonic, upon the relation of a tone to its dominant. Striving for an expressive system that should be rational, little by little they reduced all steps and figures to the affirmation of this relationship. For this system Rameau evolved his theory. Admirable as it was, it represented only a certain condensation of all the resources of the art. It remained for music in our time to open up new possibilities. The Russians, however, had no part in that tradition. Although their music recognized the essential character of that relationship, it did not make the same use of it. At the same time that Stravinsky started to compose, Russian music was a hundred years old. But it had begun to show a certain weakening of force. This was one reason impelling Stravinsky to leave his fatherland. He felt more free to fulfill his destiny in the climate of Debussy and Ravel than in a St Petersburg haunted by Wagner. But this much is clear. Though he chose to live, from then on, among foreign musicians, it was to create in a fashion unlike theirs. That he is a master is universally accepted. That his originality is unrivalled (for an eminently tonal composer) we all realize. That his influence has been formidable goes without saying. But to me as a conductor, his unique value is his fabulous variety. [...] The variety itself is manifold. There is a stylistic variety which makes each work sound new and different from the last. We are treated to a series of historical flashes ranging from Peroglesi to Tchaikovsky. We can select from a continuum that runs from irony to pure balletic entertainment to the most moving profundity. There are all degrees of complexity, from the Norwegian Moods to Petrouchka. And there is infinite variety of orchestral sonority. No two pieces ever sound really alike in timbre. The last quality is what mystifies me. Especially because the personal trademarks are always present: the niceties of his doublings, the disposition of his chords, his unconventional use of strings, his addiction to wind instruments, and his uncompromisingly lean clarity, even in the earlier works. He combines, in his handling of the orchestral groups, a stability which always guarantees a "sound," with an almost fussy way of casting subtle lights and shadows by means of meticulous detail. Yet one never tires of his sonorities. [...] Stravinsky's variety is a treasure, and a conductor's boon. In an audience, I am a fan; as a composer, a humble admirer; as a worker in the theatre, an observing student. But as a conductor, I am eternally grateful. Alert to all influences, Stravinsky receives and dominates them, only to reaffirm more and more his own personality. He is a living proof that authentic genius does not, indeed cannot, evade external influence but always absorbs and masters it. Isn't it surprising that, at the age of sixty-five, Stravinsky is still writing problem music? All the other composers over fifty—the famous ones, I mean—are turning out more or less what is expected of them. It seems a long time since we got a jolt from Hindemith. Schönberg's latest is problematical certainly, but in the same way it has been for the past thirty years. Milhaud, Honegger, Prokofiev are all sticking close to form. Only Stravinsky manages to mix his elements, including even the familiar ones, in such a way that no one can predict just where he will be taking us next. But perhaps the most impressive point of all is that over and beyond the questions of problem or influence there remains in Stravinsky's music an irreducible core that defies imitation. The essence of the man—his special "tone," his very personal brand of seriousness, the non-academic texture of his music—in short, the sum total of his extraordinary individuality, has never to my knowledge been adequately described, let alone imitated. Despite the widespread influence of his music, Stravinsky as a composer remains a singularly remote and removed figure, a composer whose passport to the future needs no signature other than his own. Stravinsky, the chameleon-musician, the man of a thousand-and-one styles, has bequeathed us a totally unified treasury of rhythm that traces a perfect arc from his first to most recent work, rising from the simple to the complex then falling from the complex to the simple. The great privilege of musicians now in their fifties is to have witnessed at first hand all the works of Stravinsky as he produced them. In 1910 I was present at the premiere of 'L'Oiseau de Feu. After that we had to wait a year, more or less, to hear the next work. Every year thereafter Diaghilev brought us the new Stravinsky—always different, always unexpected, always more than exciting. From L'Oiseau de Feu to the extraordinary Orpheus that Stravinsky played on his piano for my wife and me in Hollywood in 1947, every work has its weight, its deep resounding in our soul. Each time different problems are involved, and each time their solutions are achieved in masterly fashion. I am thankful to be fifty-five years old and to have been able, for thirty-seven of them, to observe this prodigious production. While teaching at Mills College I had a tremendous experience which increased my admiration for Stravinsky (if that were indeed possible). I established a course of study in his music, and every Tuesday I analyzed, one after the other, all his works. To go through these scores, written between 1910 and 1947, is a real comfort for a musician and his students, united in their love of art. The music of Le Sacre du Printemps baffles verbal description. To say that much of it is hideous as sound is a mild description. There is certainly an impelling rhythm traceable. Practically it has no relation to music at all as most of us understand the word. Musical Times, London, August 1, 1913, quoted in: Slonimsky, Nicolas (1953). Lexicon of Musical Invective: Critical Assaults on Composers Since Beethoven's Time. Seattle: University of Washington Press. ISBN 0295785799. Regarding The Rite of Spring by Igor Stravinsky. This intersecting of inherently non-symmetrical diatonic elements with inherently non-diatonic symmetrical elements seems to me the defining principle of the musical language of Le Sacre and the source of the unparalleled tension and conflicted energy of the work. George Perle (1990). The Listening Composer, p. 83. California: University of California Press. ISBN 0520069919. George Perle (1990). The Listening Composer, p. 84. California: University of California Press. ISBN 0520069919. For my part I did not approve of Stravinsky's predilection for Bach's method — pseudo-Bachism — or rather, I did not approve adopting someone else's idiom and calling it one's own. True, I had written a Classical Symphony myself, but that was only a passing phase. With Stravinsky this 'Bachism' was becoming the basic line of his music. Now we will throw these mediocre kitschmongers into slavery, and teach them to venerate the German spirit and to worship the German God. Arnold Schoenberg, regarding "the bourgeois tendencies of musical reactionaries such as Stravinsky and Ravel", in a letter to Alma Mahler, 1914 after the outbreak of war. Quoted in "Impressions of War" by Philip Clark, The Gramaphone, 4 August 2014. More like a sacrilege du printemps. Overheard joke of Richard Strauss, later reported to Stravinsky. Found in Kurt Wilhelm, Richard Strauss - an intimate portrait. Thames and Hudson, London, 1898. (Translated from original 1984 German edition by Mary Whittard), page 142.